Over 80% of people experience low back pain at some point. Many wait too long to have it treated and it becomes chronic, further irritating the nerves and can develop into sciatica. Sciatica is irritation of the nerves in the lower back that travel down the legs to the feet. If you have sciatica you might be experiencing burning, numbness and tingling or pins and needles into the legs and or feet. Chiropractic is known to have the highest success rates of helping patients with back pain and sciatica. Best of all, there are no harmful medications which at best cover up the symptoms and lead to many side effects. If you have been experiencing low back pain and sciatica or you would just like to experience the overall health and wellness benefits of chiropractic care, call our office at 732-780-0044. Also watch some of our other video testimonials to see what other patients have to say by clicking here: Freehold Chiropractor Reviews. Freehold Chiropractor reviews weight loss with one of his patients who recently lost 38lbs on a 30 day program. Many people suffer with weight problems and obesity is becoming an epidemic leading to many other health conditions in the United States including diabetes, heart conditions, stroke and even cancer just to name a few. People are told to count their calories and exercise yet they are still having problems controlling their weight. One reason being missed by diets including Weight Watchers, LA Weight Loss and others is that most foods being consumed are filled with chemicals as well as most things we eat, breath and drink are toxic. Just the other day I was at my parents house and saw my mother drinking a weight watchers shake and it was filled with soy and sucralose, both which can lead to health conditions, especially when consumed on a regular basis. In our office we take different approach to your weight loss and address the real issues. Toxicity and adrenal dysfunction. We examine you to test both areas, then guide you to improve both so you can reach your goals of losing weight once and for all. Recently, one of our patients, Jeff, completed our 30 day Nutritional Cleansing program. On average our patients lose 22 to 28lbs on this program but Jeff lost a whopping 38lbs (he started at 265lbs)! On top of that he reports better energy levels, less aches and pains and sleeping better. These health improvements are consistent when you cleanse the toxins from the body. Many people experience the benefits of chiropractic in different ways. Most make the call to the chiropractor for low back pain, neck pain, migraines, sciatica and numbness or tingling, but more people are realizing the total overall body health and wellness benefits of chiropractic. As a chiropractor in Freehold, NJ I feel it is very important to educate the public about what is causing your pain and the options you have to treat them. 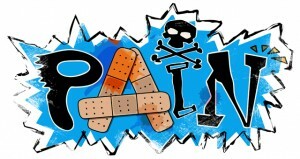 Chiropractor in Freehold Provides Pain Relief you Deserve! You are probably suffering with neck pain, back pain, sciatica, headaches or migraines, sciatica, fibromyalgia or other musculoskeletal problems and looking for an answer. Most doctors just prescribe one medication after another. These medications might give you temporary relief but you are starting to realize they do not get rid of the pain or solve the problem. While masking the symptoms, the underlying causes are actually worsening. The medications also have a list of harmful side effects that you are worried about. You have probably also thought about different injections the doctors have recommended or even surgery but these are substantially scarier options. Before you go down that road make sure you find out all the possible consequences of these treatments. Freehold NJ Chiropractor, Dr. Russell Brokstein of Hometown Family Wellness Center, reviews the full benefits of chiropractic care. While reading posts on facebook, I saw a great picture that summed up how chiropractic can help you and anybody else who is searching to be healthy without drugs or surgery. Most people seek chiropractic care when they are in pain, whether it be neck pain, lower back pain, shoulder pain, sciatica, numbness and tingling, headaches and migraines, post accident injuries, fibromyalgia and other conditions. This is just is just a small percentage of people that could be helped. to remove the pressure, chiropractors correct the underlying cause of symptoms therefore improving health and function. 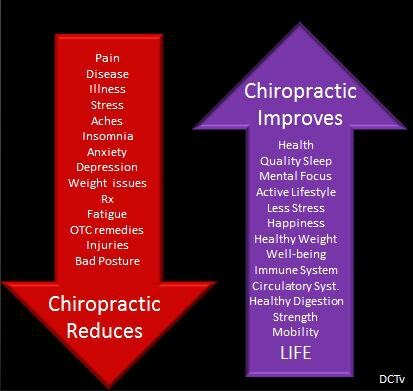 View the picture to the right and see different conditions that chiropractic can help you reduce and other areas that chiropractic improves. By being under chiropractic care, you improve your overall health and wellness all without the use of drugs and surgery. Think how this can improve your relationships with your family and friends as well as improve your activities of daily living. You can live once again! Dr. Russell Brokstein has been providing patients chiropractic care for over 14 years. He opened Hometown Family Wellness Center in Freehold, NJ in May of 2005 to provide natural health and wellness to the community he grew up in. For more information on Dr. Russell and his practice go to his website: www.chiropractorfreehold.com and call his office at 732-780-0044 to experience the full benefits of chiropractic care!